Try Starting With a Solar Water Heater | Sierra Pacific Home & Comfort, Inc.
Sierra Pacific Home & Comfort, Inc. Celebrates 35 years! We understand that making the switch from your current electrical system to a solar energy system is a big leap for some homeowners. Going from what’s familiar to having giant solar panels on your roof overnight is a big change! Why Start With the Water Heater? A water heater is an indispensable appliance, so everyone can try this option. They’re used all year long. This will allow you to see how it performs through all weather conditions. For cloudy days, a backup system is installed that helps carry the weight. In other words, a water heater is a serious appliance with daily usage, but it won’t be the end of the world if it performs under your expectations. It’s a low-risk, high-reward scenario. Are Solar Water Heaters Better Than Normal Water Heaters? The second thing you may be wondering is how they compare to water heaters fueled with natural gas or with electricity. These systems are highly efficient, using about 80% of the sun’s radiation. Altogether, it means you can expect a 50%–80% decrease in your water heating bill by switching to solar energy. Very little maintenance is required to keep them running, given that they lack parts like burners and pilot lights. In fact, they’re known to last for about 20 years—double the lifespan of a normal tank water heater. As expected of solar energy, your solar energy water heater will be an eco-friendly alternative that might even be eligible for various tax incentives. Active systems: In these systems, water is pumped directly through the system. That can be direct, meaning that the water itself is heated. They can also be indirect, which involves heating a heat-transfer fluid. In our climate, a direct system is the most suitable. Passive systems: These systems are less expensive and will last longer because there are far fewer moving parts. However, they can also be a good choice in our climate since we rarely experience freezing cold temperatures. 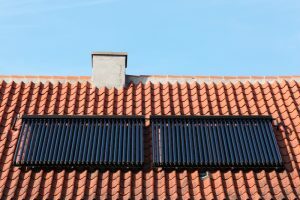 To know which type of solar water heater is best for your system, there’s no better way of knowing than by asking someone from a certified solar company in Roseville, CA. To find out if solar water heating is a good fit for your home and lifestyle, contact Sierra Pacific Home & Comfort, Inc. The Guys in the Big Red Trucks!